Since it was first introduced to the American roadways, the Ford Flex has been turning heads left and right. The Flex is a full-size crossover utility vehicle, but it’s appearance is unlike any other vehicle in its segment. Ford sought out to create a seven-passenger family vehicle that was not a minivan, which was losing popularity since the late 90’s. Ford’s solution was the unconventional Flex, first unveiled at the 2007 New York International Auto Show. The 2015 Ford Flex has prove itself a worthy competitor in the full-size crossover segment, ousting popular vehicles like the 2015 Honda Pilot. Not only is the 2015 Ford Flex affordable, it also comes with more standard features than previous model years, making it a great choice for families. When designing the Flex, Ford desired to create a minivan alternative, and they succeeded. The Ford Flex is a great option for families that want versatility, without the minivan stigma. Choosing the right family vehicle is important. There are a lot of vehicles that exist on the market that cater to families, so how do you know which one to choose? Two of the most popular CUVs available today, are the Ford Flex, and Honda Pilot. Both vehicles offer similar standard features, and even the same fuel economy, but the Ford Flex rises above when it comes to other integral categories. Price: One of the most important factors to consider when purchasing a new vehicle, price can make or break the possibility of vehicle ownership. The 2015 Ford Flex has a starting MSRP of $29,100, while the 2015 Pilot comes in at $32,120. What may seem like a minor difference, actually makes a big difference when calculating monthly payments. Comfort: Both vehicles offer enough room for seven occupants, but the Ford Flex has considerably more room for those passengers to stretch out. The Flex also offers more head and legroom, making it a popular choice among even the tallest of drivers. The 2015 Pilot comes up short in the spacious cabin category, giving the Flex the clear advantage. Dimensions: The 2015 Ford Flex has a smaller, slimmer overall footprint than the Honda Pilot, offering drivers more flexibility when it comes to parking in small spaces. The Honda Pilot requires a larger parking space than the Flex, making it a more difficult vehicle to use on a day-to-day basis for running errands. Power and Performance: The 2015 Ford Flex offers drivers a standard 3.5-liter V6 DOHC engine, while the Pilot comes standard with a similar 3.5-liter V6 SOHC engine. The difference between the two comes in the form of horsepower, which the Flex simply has more of. The 2015 Flex features 287 horsepower, while the 2015 Pilot tops out at 250. The Flex is clearly the obvious choice when it comes to power and performance. Interior Quality: The Ford Flex offers a beautifully appointed cabin, even on the base model. The gear shift knob, for instance, is wrapped in leather, while the Pilot’s gear shift knob is plastic urethane. Ford utilizes higher quality materials throughout the interior of the Flex, while Honda opts for the less expensive appointments in the 2015 Pilot. The Ford Flex has built a reputation on its ability to stand out in a crowd. Even more than the exterior boxy appearance of the full-size crossover, the Flex has a long list of standard features that continue to help it turn heads on the road. Starting well under $30,000, the 2015 Ford Flex was ranked eight out of thirteen Affordable Large SUVs by US News and World Report, and for good reason. Check out all of the offerings that the Flex comes with for the 2015 model year, as both standard and optional equipment. Available SYNC and MyFord Touch technology with a full-color 8-inch touchscreen and 4.2-inch LCD instrument cluster screen. Optional PowerFold third row seats that flip and fold down to a flat floor surface for extra cargo. Available second-row refrigerated console can keep up to seven 12-ounce cans at a chilly 41 degrees Fahrenheit, or can keep things frozen at 23 degrees. Advanced safety features available such as, adaptive cruise control, collision warning, brake support, and Blind Spot Information System with cross-traffic alert. Thousands of people all over the United States are saying goodbye to the outdated minivan, and hello to the innovative and stylish 2015 Ford Flex. The wagon-style full-size crossover SUV has been touted as the best minivan alternative by drivers and critics alike. 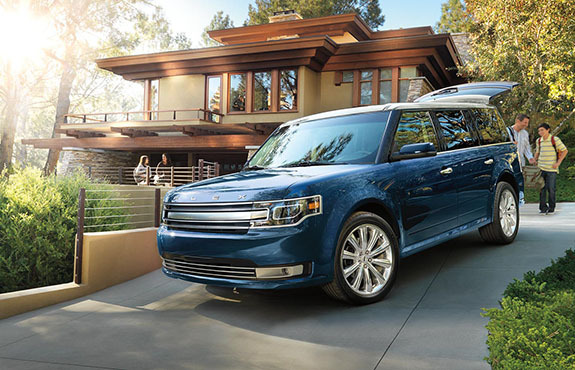 With seating for seven, a roomy cabin, plenty of cargo space, and even decent towing capabilities - the 2015 Ford Flex eliminates the need for families to drive the tired-old minivan once and for all. The optional twin-turbocharged V6 engine packs more power than any minivan on the market, and even comes standard with heated side mirrors. The Flex also gets decent fuel economy, with an EPA-estimated highway rating of 23 miles per gallon. 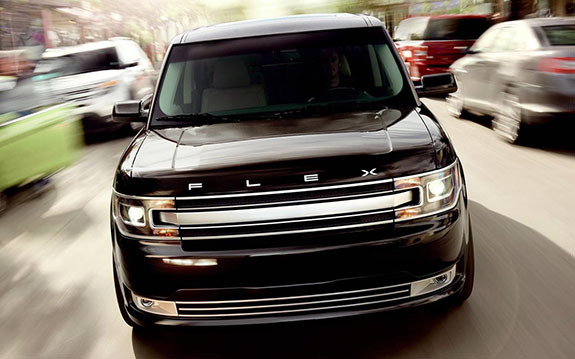 The 2015 Ford Flex is the crossover SUV that drives like a car, and has the cargo and passenger capacity of a minivan. With its low-to-the-ground clearance, getting in and out of the Flex has never been so easy, and loading passengers into the third row of seating is made easy by Ford’s second-row glide technology. Whether you are driving kids to and from practice, driving to the grocery store, or hauling the boat to the lakehouse for the weekend - the 2015 Ford Flex has you covered. Ditch the minivan, and discover the FLEX-ibility of Ford.